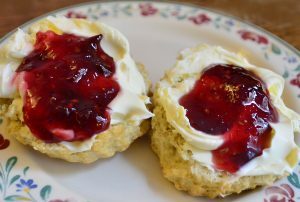 Cream Tea Cruises are held most Bank Holiday Mondays at 2.30pm. So join us for yet another cream tea trip where everyone will be served scone, jam & cream with tea, coffee or a soft drink. If you have a particular dietary requirement just give us a call. These trips depart from Hungerford wharf and last about 2 1/2 hours, going through two locks and then returning to the Wharf. Adults: £12.50 ; Seniors: £11.50; Children: £9.00; Children under 3 travel free. 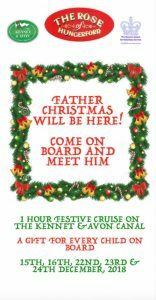 Join us for a 1 hour festive cruise along the Kennet and Avon Canal. Father Christmas will be there and refreshments will be provided for all. 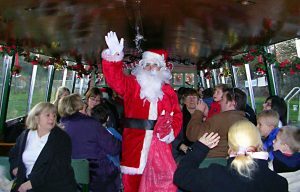 Trips start from Canal Walk, Hungerford, RG17 0EQ (just off the High Street) and return there 1 hour later. Ticket price £8, this includes a gift for each child.